"I'm always curious about the mechanics of the story, who is narrating and I like to try to play with that. I learned how to use the word 'you' from William Burroughs.. I was into more slightly playing with the autobiographical I, but Burroughs was really wonderful at saying 'you people, you people who are in the audience' ... so I began to write somethings that were addressed that way, almost like political speeches." 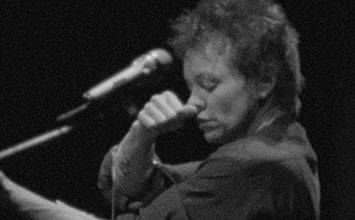 Laurie Anderson is a highly acclaimed performance artist who also became an unlikely pop star in the 1980s. She was a pioneer of multimedia Performance and Installation art, before crossing over into the popular music industry with songs from her large-scale performance pieces, later producing full albums for commercial release. As one of the first artists of her downtown New York context to achieve a level of commercial fame, she was at the forefront of debates around the influence of mass media on the art world. She has since been recognized as being remarkably ahead of her time in embracing of new technologies in art and performance practice, and in her engagement with new media to share her work. Anderson is a classically interdisciplinary artist, drawing on the forms, techniques and strategies of many different art forms and expressing herself across a huge array of different mediums. Performances, music, installations and film works are often autobiographical in nature, and encourage a sense of intimacy with the viewer through her characteristically meditative tone and calm delivery. Despite this calmness, Anderson's work often features political content and engages with societal issues. Her work often involves mediating and changing her own voice as she tells stories and narrates her thoughts, framed by the striking images she creates through props, costumes and the innovative use of projection and lighting. Her artworks therefore often have a futuristic, almost science-fiction aesthetic. Anderson's practice straddles several distinct artistic disciplines, questioning the division between them and opening up new hybrid possibilities for artists and musicians. She draws on her abilities as a musician, performer, conceptual artist, scientist and inventor to blend together aesthetic elements from art, theatre, opera, popular music and scientific and technological experimentation, also encouraging the cross-pollination of audiences between forms. Technological innovation has always been key to Anderson's work, from her aural experimentation with tape loops, overdubbing, and recording technology in the 1970s and 80s to her use of projection and experimental theatrical lighting. This introduced new aesthetic vocabularies to galleries and performance spaces. She continues to innovate with her most recent digital experiments in virtual reality and binaural sound. Her work has been particularly significant in the development of performance art in the 20th century. Anderson embarked on high profile and large-scale performances in the 1980s that introduced the more traditionally theatrical elements of large and carefully designed sets and props, extensive rehearsal and repeat performances to an art form previously dominated by spontaneity and a DIY aesthetic. Electronic music has also been hugely influenced by Anderson. Her pioneering use of synthesizers, vocoders, and sampling technology on her albums in the 1980s are regularly cited as an inspiration by later musicians, as they were some of the first records played on commercial radio and TV. Anderson contributed and corresponded to the postmodern dismantling of hierarchies of culture, making clear to her audiences, and artists inspired by her, that the border between 'high' and 'low' culture was artificial. In her work concepts and strategies rooted in experimental art forms and influenced by other artists and art movements are used within mass media contexts, such as the music industry or commercial television. And ideas and aesthetics from television, popular music, and commercial theatre were similarly brought back into the 'high culture' context of the gallery and opera house. 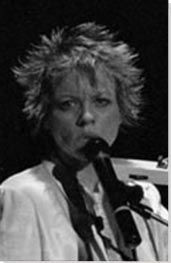 Laurie Anderson was born in the Glenn Ellyn suburb of Chicago in 1947. She was originally named Laura Phillips, and grew up in a family of ten with four brothers and three sisters. At the age of five, Anderson began studying classical violin. As she explains, "All the kids were more or less forced to play an instrument. And some of them had absolutely no musical talent whatsoever. But they banged away on things anyway, because my parents thought it would be nice to have an orchestra." As a teenager, she would practice up to six hours a day, and often performed with the Chicago Youth Symphony. Anderson also took advanced art classes at the Institute of Chicago, and her early years were split equally between music and painting. Interactive chart with Laurie Anderson's main influences, and the people and ideas that the artist influenced in turn. First published on 01 Apr 2018. Updated and modified regularly.